Vanessa Kingori “never thought” she could be the publisher of Vogue, “although I’m embarrassed to say that now.” A black immigrant born in Kenya, raised in St Kitts, “I’d never seen someone who looked like me running the commercial side.” Not only that, in the magazine’s 102-year history no previous publisher has been female. At the time Kingori was publisher at GQ. As a mark of how little changed at Condé Nast (the parent company), the newest staff member in her office had been there seven years. Then: revolution. Vogue’s editor Alexandra Shulman retired after 25 years, Stephen Quinn, the publisher, after 26, and Nicholas Coleridge, the president of CondéNast, after 28 years. Following them out of the revolving doors of Vogue House in Hanover Square were deputies, directors, section editors, assistants and multiple bag-carriers. One can only imagine them, gloved and in sunglasses, leaving a trail of coloured feathers. For the past 10 months, Enninful and his new team have been building from scratch. A new-era Vogue to respond to shrinking magazine sales, dwindling advertising revenue and an explosion in online and social media. “Good luck!” might have been the departing cry from their predecessors. Until now, both Enninful and Kingori been quiet. Kingori says they wanted the figures to speak before they did. Total sales are up 7.5 per cent since Edward’s first issue and UK newsstands sales have also increased. Total advertising revenue is up too, fuelled by a 26 per cent increase in digital advertising, and the company reports a 1,033 per cent increase in events and special projects revenue. Among her coups at the company so far are persuading a number of megabrands to return — including Nike — as well as bringing in first-timers such as super cool Palace Skate and a sponsorship with Pinterest. Amazing though it may sound, Louboutin had never advertised in Vogue (or anywhere) so Kingori persuaded him to do a project around his “nudes” — he has a range for 30 skin tones — to chime with Vogue’s drive for inclusion. Although she wears it lightly, Kingori sees her role as political. 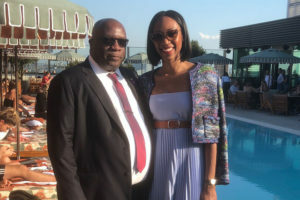 She describes herself as “a child of the Windrush” (her mother came to the UK from St Kitts as a nurse aged 17, met her Kenyan father in London, and returned to London when Kingori and her sister were seven and nine). And one thing was always clear: new era Vogue was about diversity and “new frontiers”. Enninful’s first cover featured Adwoa Aboah, a mixed-race London model, and the current cover features Halima Aden, the first hijab-wearing model to be used on a cover, as well as nine others from different ethnic backgrounds. She is quick to point out that “diversity is not just about race. It’s about diversity of perspective, which is also about class.” (This was briefly a raw nerve: in the post-Shulman exodus, there were unattributed quotes saying the new regime was wiping out posh girls). They are friends. Now they work together, travel together, spend hours on the phone. Enninful is “hilarious”. There is an “Edward fan” in reception every day and last week an entire trolley of flowers arrived as an expression of thanks from a fan who finds new Vogue “makes me feel better about myself”. One model he has featured heavily is Naomi Campbell. In some respects he has reinvented her. While still hugely successful, Campbell had a sketchy reputation — not least because of a string of assaults against various assistants, housekeepers and airline staff. She was also notoriously late — sometimes days late — for shoots. Far more than any racism, she remembers that the headmistress, Sister Brenda, would make them kneel if she passed them in the corridor, “and if your skirt didn’t touch the floor when you did you’d be in detention”. After university, Kingori worked briefly for Matches and then the Evening Standard where her boss told her, “One day you’re going to be the publisher of Vogue.” She says she isn’t entirely sure what that meant at the time, “but I saw him the other day and he said, ‘Do you remember?’ And I said, ‘I do, I do’.